SAW035931 SCOTLAND (1951). 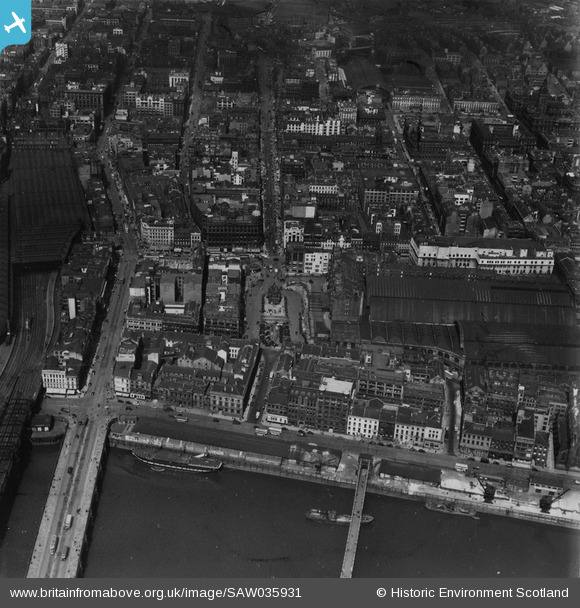 Glasgow, general view, showing St Enoch Station and Jamaica Street. An oblique aerial photograph taken facing north. This image has been produced from a print. Title [SAW035931] Glasgow, general view, showing St Enoch Station and Jamaica Street. An oblique aerial photograph taken facing north. This image has been produced from a print. The foundation stone of St Enoch's was laid on April 12th 1780. Built about twenty years after St Andrew's Church, it is similar in style. Enoch is a corruption of Thenew or Theneu, who was the mother of Glasgow's patron saint St Kentigern (also known by his nickname, Mungo), and the church was built on the site supposed to be that of an earlier church situated on or near her burial place. It was rebuilt in 1827, retaining the old spire, and demolished in 1925 when the congregation moved to St Enoch's Hogganfield. The Surgeons' Hall, with four columns above its main entrance, is on the east side of the square, on the left of the picture. The east side of the square was demolished in the 1870s to make way for St Enoch Station and is today the site of the St Enoch Shopping Centre. The St Enoch Picture Theatre in Argyle Street began life as a music hall, Crouch's Wonderland, which showed films from 1897. It was renamed in 1913, although variety shows continued to be staged until the 1920s. The cinema closed in 1935, although the building survived as a shop. The Argyll Arcade was one of Europe’s oldest covered shopping arcades and Scotland’s first ever indoor shopping mall. The L-shaped arcade was built in 1827 in the Parisian style. The arcade was cut through old tenements and provides a link between Argyle Street and Buchanan Street. Gordon Street at Central Station and Central Hotel. Corner of Clyde St and Jamaica St.
North Hanover Street circa 1964. Dundas Street entrance to Queen Street Station. Stewart & McDonald building (founded in 1826) was a firm of clothing wholesalers and retailers with a famous department store on the corners of Mitchell, Argyle and Buchanan Streets. The firm also owned clothes factories in Glasgow, Leeds and Strabane. In 1913 the retail section of the business was hived off and the department store was renamed McDonalds. Taggarts...anyone remember what this was? The City of Adelaide is a clipper ship, built in Sunderland, England, and launched on 7 May 1864. The ship was commissioned in the Royal Navy as HMS Carrick between 1923 and 1948 and, after decommissioning, was known as Carrick until 2001. At a conference convened by HRH The Duke of Edinburgh in 2001, the decision was made to revert the ship's name to City of Adelaide, and the duke formally renamed her at a ceremony in 2013. City of Adelaide was built by William Pile, Hay and Co. for transporting passengers and goods between Britain and Australia. Between 1864 and 1887 the ship made 23 annual return voyages from London and Plymouth to Adelaide, South Australia. During this period she played an important part in the immigration of Australia. On the return voyages she carried passengers, wool, and copper from Adelaide and Port Augusta to London. From 1869 to 1885 she was part of Harrold Brothers' "Adelaide Line" of clippers. After 1887 the ship carried coal around the British coast, and timber across the Atlantic. In 1893 she became a floating hospital in Southampton, and in 1923 was purchased by the Royal Navy. Converted as a training ship, she was also renamed HMS Carrick to avoid confusion with the newly commissioned HMAS Adelaide. HMS Carrick was based in Scotland until 1948 when she was decommissioned and donated to the Royal Naval Volunteer Reserve Club, and towed into central Glasgow for use as the club's headquarters. Carrick remained on the River Clyde until 1989 when she was damaged by flooding. In order to safeguard the vessel she was protected as a listed building, but in 1991 she sank at her mooring. Carrick was recovered by the Scottish Maritime Museum the following year, and moved to a private slipway adjacent to the museum's site in Irvine. Restoration work began, but funding ceased in 1999, and from 2000 the future of the ship was in doubt. After being served with an eviction notice by the owners of the slipway, the Scottish Maritime Museum was forced to seek the deconstruction of the ship on more than one occasion, while rescue proposals were developed by groups based in Sunderland and South Australia. In 2010, the Scottish Government decided that the ship would be moved to Adelaide, to be preserved as a museum ship. In September 2013 the ship moved by barge from Scotland to the Netherlands to prepare for transport to Australia. In late November 2013, loaded on the deck of a cargo ship, the City of Adelaide departed Europe bound for Port Adelaide, Australia, where she arrived on 3 February 2014.